Looking for private in-home or in-studio Trumpet lessons? Our Catoosa teachers are ready to get you started. Find your teacher today! Check out some of our most popular teachers near Catoosa, OK including Tulsa, Broken Arrow, Bixby, Jenks and Mounds. •	I have over 20 years experience as a music teacher, conductor, theater/orchestra director and a performer in Russia, Norway and the United States. •	I possess excellent interpersonal skills and over the years developed the ability to communicate efficiently and connect with every student I teach. •	I am creative and enthusiastic while working with people of all ages. •	I have a reputation of being passionate about achieving professional goals. •	Taught acting, improvisation, singing. Produced musical shows. •	Instructed students on Piano, Guitar, All string and wind instruments and vocals. •	Prepared students for the auditions to the prestigious schools and other music organizations. Would you just like to learn a few songs on the piano, violin or guitar? Or you'd like your child be become next Joshua Bell or Evgenij Kissin? My lessons are designed with each individual student in mind. I will start my lesson with introduction and proceed with warm-up routine. I always make sure that the student is comfortable with the pace that I am offering. I am mixing elements of music theory, history and performance techniques in order to help my student to embrace the beauty of music making experience. All my students are ready to perform at the recital after just 3-4 months of lessons. I teach using Fisher Baby Grand Piano. Fender guitars. Major brands band instruments; yamaha, selmer, gemeingardt, etc. Fender Guitar, Yamaha Flute/Saxophone, Casio Digital Piano, Custom Violin made in England. Very knowledgable and enthusiastic teacher. He has a way about him that makes the lesson exciting. Mr Yakov is very pleasant, patient and professional. He makes learning fun. One of my daughters is very shy and particular. I was concerned for her first violin. But she ended up loving the lesson and the instructor. We did some lessons online and at his studio. During the online lesson, the connection with our internet was horrible. He could hear her playing but she couldn't hear him. Yet, patiently, he got creative and taught the lesson with my daughter through chat. The environment of the studio is comfortable. You can tell he's passionate about what he does. That left me with a great impression of him. We look forward to more lessons with him for as long as we can. My doctorate is in music and I have experience teaching music at multiple universities, as a public schools teacher, and as a private instructor. I have a doctorate in music and I suggest that all beginners start with the Essential Elements books. I customize lessons to individual needs and desires. I hope you'll consider booking with me today. Let's start your musical journey! I look forward to hearing from you! 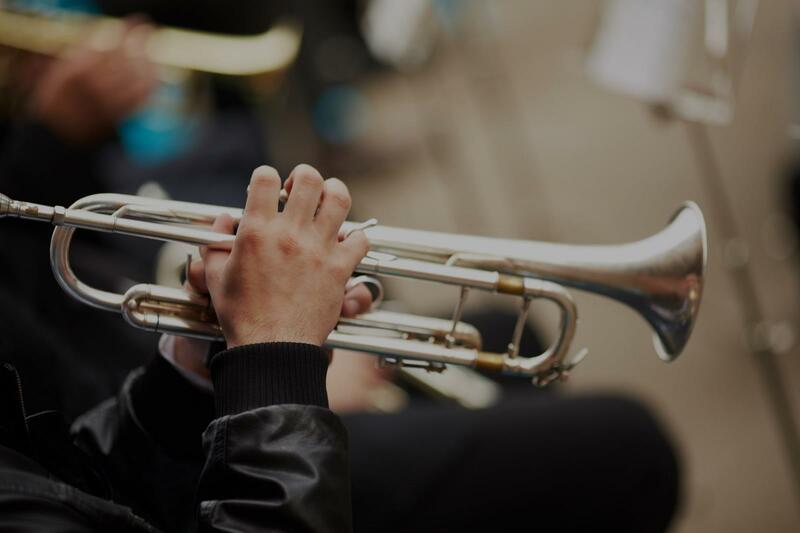 Intermediate students will polish their reading skills as well as learn the scales, arpeggios, flexibility and dexterity exercises to take their fluency on trumpet to the next level. Advanced players have the opportunity to learn how to expand their upper register, how to improvise in Jazz and/or whatever else the student would like to improve on their trumpet. world extensively as a featured trumpeter/vocalist performing The Music Of New Orleans . I began teaching professionally around 2011 when I joined the faculty at the Don Jamison Heritage School of Music in New Orleans as the brass instructor where I also teach theory, brass class and a New Orleans style Brass Band Class. I've done clinics (internationally) and taught students of all ages. I really believe that when you have a desire to do something (like learn to play trumpet), your desire is a signal that you have the potential to be great at it! I’m excited to help you be great! So before I started lessons with Leon, I was relatively new( self taught) a learning the trumpet and I was nervous about taking lessons. Mostly nervous because I didn't know what the instructor was going to have me change, and was nervous that the instructor wouldn't be understanding of my faults. Leon Brown during the first lesson showed me that although he was my teacher, he was also there to help me progress and get better as a player and person. Every lesson after that my nervousness became less and less and my confidence has grown within 5 lessons. I recommend Maestro Brown as a Trumpet teacher because he takes his time, makes sure you grasp the lesson, provides a comfortable atmosphere, and with hard work and dedication outside of the lesson, he will notice the work you put in. Take the chance, don't be scared to get started on your musical journey like I was and take a chance with Mr. Leon Brown. For me at least, I have not regretted my decision and will continue lessons with him for as long as I can! Very valuable session. Leon has a calming and patient manner. I myself am a master's degree carrying teacher so I appreciate good instruction. your part as a student. You will be fortunate and blessed to have him as a teacher.None better. I am a current band director focused on your student's mastery and success on the trumpet. We will work on tone, range, and develop technique through a tailored lesson that will fit you or your student. I am also happy to supplement your child's band instruction and work on area/region honor band auditions with your child. Your first lesson begins with breathing exercises as we need air to play trumpet. Proper posture, embouchure, and making a nice sound will come next. And later we will work on the more intricate aspects of trumpet playing such as articulations and range, while learning new songs! If you are already familiar with the basics of playing trumpet, we will work on the specific areas you want to work on. I'm glad you have decided to take trumpet lessons and look forward to helping you make great music! So what are you waiting for? Let's get started! In the past 4 years, I have tutored dozens of students and worked with different trumpet players in my area. As a music major at the University of Illinois, I seek a way to continue my passion for teaching and seeing students develop into wonderful players. Trained in general music, theory, and skills in teaching, I can truly connect with your student and ensure that they gain knowledge and learn to love playing their horn! The most valuable way a student can learn is if he or she has a positive connection with the teacher. In my case, I ensure that I understand not only the student's strengths and places for improvement, but also the uniqueness of his or her character and what teaching methods the student responds to. Every child is unique in how they learn, and all deserve a positive experience without intimidation and impatience from teachers. Teaching music also goes hand in hand with teaching your student dedication, work ethic, and strong character! I am a current Music Education major at the University of Illinois Urbana-Champaign, pursuing a minor in Psychology. Before that, I attended West Aurora High School as the first chair trumpet player in the concert and jazz setting for 2 years, and was a trumpet section leader and drum major of the marching band there. t the prestigious Smith Walbridge Drum Major Clinics, where I earned my 1st class rank nationally as a leader in teaching music. I have been tutoring trumpet for 4 years, and have been playing for 10. I have taught between the ages of 10 and 17, and have experience on the beginning level up to classical and jazz music at the advanced level. Teaching is one of the greatest experiences I have ever had, and doing what I love for the rest of my life is a blessing in itself! With my students, I work on creating a positive and comfortable playing environment so that the student feels safe making mistakes and asking questions. The only way to grow as a player is find the confidence to fail. As brass players, we need diligence, patience, and strong work ethic to improve, and a safe place to gain these skills is essential to every student. I want to get to know exactly how the student plays and what their goals are so I can work with them on achieving them and a little bit beyond them as well. Learning how to play an instrument or get better at it goes far beyond simple instruction- it comes from a connection to the music and a joyful willingness to mess up sometimes! That's how we grow. Last year our 10-year old daughter started playing the trumpet in Beginning Band. Over half-way through the year she missed a lot of school due to illness, got behind and was forced to drop-out of band. Over the summer we started online trumpet lessons with Mercedes to help our daughter catch up with her peers. We feel so fortunate to have found Mercedes! She is an EXCELLENT teacher. She is enthusiastic about music/playing trumpet, creative in all the ways she helps our daughter improve, positive and patient (SO important when teaching beginners) and she truly is amazing at keeping our daughter engaged during every lesson. During each 30 minute lesson, our daughter makes noticeable progress! Plus Mercedes keeps the lessons fun so our daughter happily participates. Thanks to the progress she has made with Mercedes, she is feeling confident enough to return to Second Year Band later this month. We plan to keep up the lessons with Mercedes and look forward to her ongoing support and guidance during our daughter's important beginning-to-intermediate instrument learning stage. I've taken lessens with Mercedes for two years. Every time I left a lessen I had a lot of good ideas and ways to strengthen my playing. I never felt like lessens with Mercedes were a teacher to student environment. It was very chill and more like friend helping friend. That to me is the best relationship to truly learn. Mercedes helped me learn a sense of confidence that is not only used in Trumpet but in life. semble, New School Afro-Cuban Orchestra, CCPA Jazz Orchestra at Jazz showcase in Chicago, Lincoln center, Aron Davis Hall,john Beasley at Harlem Stage, Jazz at Lincoln Center, and Bronx Music Heritage Center. Learning to play the trumpet is a rewarding experience. Many people think you need to be big and tough to play the trumpet. But it's quite the opposite - it is an instrument requiring precision coordination between the embochure (lips) and the fingers. It's more akin to precision surgury than an athletic competition. I will help the student develop a good foundation to play the trumpet well. Everyone wants to play loud and high but developing a good sound is crucial before attempting advanced techniques. I will help the student make sure they are developing and progressing in the right direction. We are a husband and wife piano teaching team that enjoy seeing children grow as they expand their musical skill set. We are firm believers of learning the fundamentals. We teach all ages and levels, and want our students to be having fun! And if your piano needs a tuning, we do that too! It is great getting a student to think and analyze the task at hand. It might seem too hard at first, but I will walk the student through the process of figuring out how to play a piece. Learning music gives you a lot of skills applicable to everyday life. Mr. Higgins is a wonderful piano teacher! He is very receptive to my overall goals with piano and tailors each of our lessons to meet my abilities and ensure that I am learning well-rounded skills. During our lessons we review workbook music, (beginner) classical pieces, technique, and ear training. I'm really enjoying learning from Mr. Higgins, and he makes each lesson both educational and fun! I’m a professional trumpet player and music teacher who has experience teaching thousands of students. Many of my trumpet players go on to play in local auditioned festival ensembles. I teach and play both classical and jazz and have experience with many other genres. We will use some age old trumpet methods (Arbans, Clark, Schlossberg etc.) as well as some exercises I’ve developed over the years to help students advance to the next level. I also have experience teaching beginner-intermediate guitar and beginner piano and love to use my professional playing experience with all instruments to bring students to a real-world playing level. I love the sound of the Trumpet! It was my first love in the brass world, and I want all my students to fall in love with it too. My goal is to give my students the skills they need to excel in performance and in practice. I always teach so that my students can eventually teach themselves. I take great joy in tailoring my teaching style to fit my student's learning style. Can't find a teacher in Catoosa, OK?